One of the key natural features of the Okanagan Valley is a chain of lakes that are connected by the Okanagan River. Many small and medium-sized communities dot their shorelines. Vineyards and orchards welcome visitors and residents. It is a remarkably beautiful region. 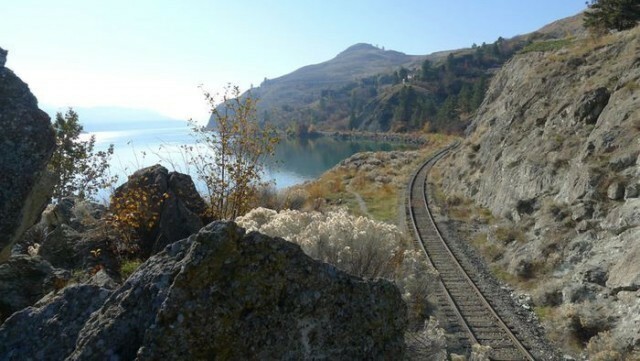 Over the last few years trail development for hikers and cyclists has progressed to a point where it becomes feasible to connect all communities of the Okanagan Valley including Osoyoos, Penticton, Kelowna, Lake Country and Vernon with a continuous 250km pathway. Over 70% will follow abandoned rail trails along beautiful lakeshores, valleys and rivers. Only a very small portion will follow Highway 97 on a separate bike lane or go through suburban areas on residential roads. The Okanagan Valley has established an international reputation as a cycling paradise. Unfortunately many cycling events are at the local level since there currently is no safe way of cycling from community to community. Several local governments and volunteer groups including The Trail of the Okanagans, The Okanagan Rail Trail Initiative, The Gellatly Bay Trails and Parks Society and The Shuswap Trail Alliance have developed plans to address this situation. The vision of a valley-wide cycling corridor includes the development of loops and spurs that provide access to communities, vineyards, beaches, parks, the Trans Canada Trail and the many single-track mountain bike areas. Various studies have shown that significant economic benefits can be realized by encouraging cycling-tourism. In addition a safe, affordable, green transportation option is required for commuters and students visiting UBC Okanagan and the various facilities of the Okanagan College. Though significant investments have already been made by local municipalities, regional districts and the Provincial Government, additional funding is required to build safe cycling lanes along sections of Highway 97, to acquire land leases from private owners and the Okanagan Nation bands, and to construct trails or to improve the surface of existing trails. These infrastructure investments are expected to yield significant returns by extending the short summer tourist season into the spring and fall shoulder seasons, which is required to make additional private investment for businesses including hotels, restaurants viable. The $1 billion for cycling and walking proposed by the BC Cycling Coalition would greatly speed the completion of Trail of the Okanagans and other cycling improvements in the Okanagan thus enabling residents and visitors to experience the economic, health and environmental benefits of cycling sooner. Please sign the petition and share it with your friends, family and co-workers. Lougheed Hwy and the Mary Hill Bypass shoulders are often covered in gravel, rocks, etc. MOT says there is a contract to sweep shoulders every 90 days, which does not happen, and even if it did this is too infrequent. Clear shoulders makes for safer cycling! Painting the bike lanes green in areas where traffic needs to crossover, or in other safety critical spots, is very important in my opinion. Inexpensive & effective! There are numerous locations throughout BC where the construction of rumble strips along with the placement of concrete barriers has reduce the useable shoulder surface to less than 600mm. This is unrideable and unsafe forcing riders into high speed traffic lanes. The MoTBC design standards specify that the paved shoulder should have a minimum width of 1.5m. Cyclists lives are being placed at risk to protect motorists who are essentially unattentive for any number of reasons. This is unacceptable as it is based on discrimination in that it implies that cyclists are less worthy of protection than careless drivers.